2 cats and a baby: School Days! 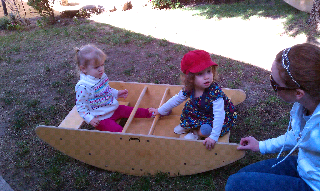 We had playgroup at the Waldorf School today! I love taking Alison to playgroup. A big bowl of oatmeal and two yogurt cups! We arrived at school a little early today so I was able to take some pictures! Alison's little friend and her mom were there too! These little "boats" are so neat! Alison's friend wasn't able to make it to her birthday party but she gave Alison a gift anyways! Its a trunki! A cute little suitcase that has wheels and is scooped in the middle so she can ride on it as well. They knew we were going to be traveling to Florida and thought we would like it and we LOVE it! Alison pushed it around the rest of the day going "choo choo!" Daddy came home today as well and brought an early Christmas gift! Alison found her new coat to be very snugly.